Frog and Toad have so many things going for them, mainly that they are AWESOME characters who hold up really well after all these years. I love "A Lost Button"* because it's repetitive enough to bring little kids along after a button or two. Actually, I just realized that it would pair pretty perfectly with Pete the Cat and his Four Groovy Buttons, and then you could talk about how Toad freaks out v. how Pete stays calm. Anyway, I didn't do that. I usually keep the puppet show shorter than a traditional storytime because it's at lunch time on a Saturday and it seems like my families swing by while they're downtown + then head to lunch. It's a quick little 15 minute deal from shaking our sillies out to singing one last song to say goodbye (in this case, 5 green and speckled frogs). I've noticed that, probably because the kids can't see me behind the puppet theatre, they get REALLY squirmy if the actual show is longer than about 7-10 minutes. Obviously, adapt to your crowd/age group/etc. For the script I tried to stick as closely as possible to the language in the book, because it didn't need any help. I mean, it's Lobel. I cut out buttons from different brightly colored felts and drew four holes, two holes, etc. I did all the buttons from the book except the thin one, because I couldn't figure out how to represent that to the kids. I also constructed a jacket on Frog with felt. I maybe should have been more careful with Frog and the hot glue gun as he is now missing some armpit hair. Before the show, I set up each button in order from right to left so Frog could pick it up as they walked. I asked the audience to slap their hands on their thighs any time Frog and Toad were walking, to liven up the parts of the script where they're wandering around. I also asked them to make a door slamming sound when Toad has his tantrum, and to applaud when Grog gets his button jacket. The kids think it's HILARIOUS when I poke my head through the puppet theatre curtains to give them a stage direction. The whole front of my puppet theatre is felt board, so whenever Toad stuck a button "in my pocket" I put it on the felt board just underneath the stage so the kids could see all the different buttons as they added up. When we were ready to put the buttons on Frog's jacket, I enlisted the kids int eh front row to each put a button on. Whenever I take a play from a book, I have the book available for checkout afterward and talk it up. All my Frog and Toad books got checked out that day! 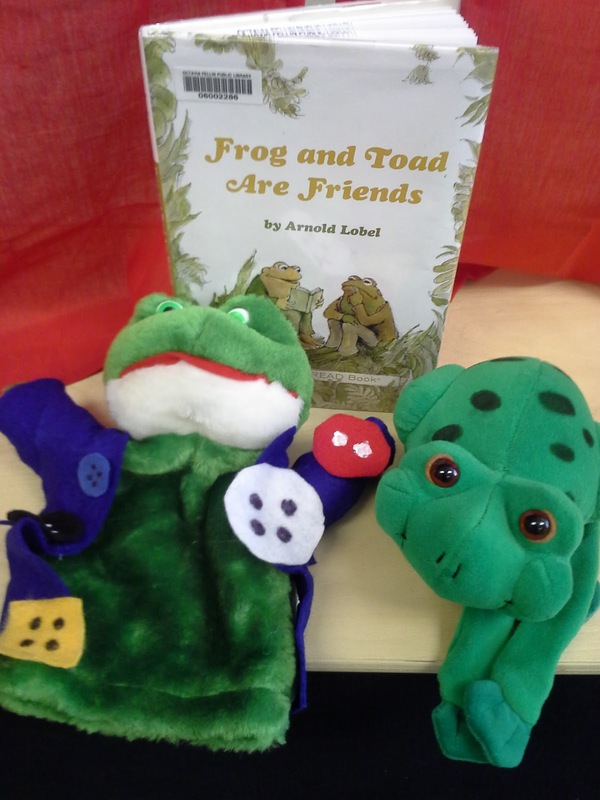 *"A Lost Button" can be found in Frog and Toad are Friends. Cory Eckert is the Youth Services Manager/Manager of the Children's Branch at the Octavia Fellin Public Library in Gallup, NM. She received her MLIS in December of 2010 having never once heard of a flannel board, and has learned everything she knows from Flannel Friday. Her favorite flannel story of all time is I Am The Biggest Thing In The Ocean, but she ruins the ending by cracking up before the last page. She believes that shaking your sillies out is an essential part of living a complete life. It sounds like your puppet shows are a lot of fun! Cory, this is a fabulous guest post. We need to here more from you! DO consider starting a blog, or at least being a regular guest! What a lovely puppet play idea, Cory. I love that you described details of how you present it in your program. I'll have to look up this Frog and Toad story and give it a go. Thank you!